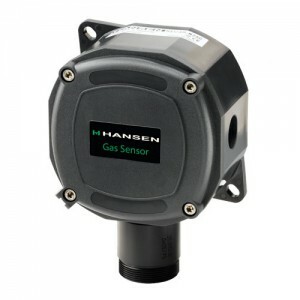 Hansen Technologies offers a complete line of industrial quality Gas Detection Sensors, Monitors and Alert Systems for refrigerants and other common gases. These state-of-the-art gas detection products utilize a range of sensing technologies to suit a given application. Available in several configurations to meet various application requirements with optimum accuracy and reliability. APPLicAtionS Hansen Gas Sensors are suitable for use in industrial refrigeration engine rooms, cold storage rooms, processing rooms, truck docks, and for relief valve vent lines. They are also suitable for use in supermarkets, and large institutional and commercial buildings. Typical gas detection applications include Ammonia, Carbon Dioxide (CO2), Hydrocarbons, HFCs, HCFCs and CFCs. For operating temperature down to 0ºF (-17ºC). The Standard sensor comes in a NEMA4 (IP65) watertight enclosure. Mountable indoors or outdoors (out of direct sunlight). Enclosure is ABS material with a gasketed ABS cover; single ½” conduit knockout is provided.